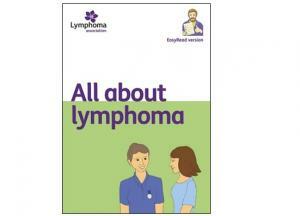 Lymphoma Action | Have you used our EasyRead booklet? Have you used our EasyRead booklet? This Learning Disability Week, we are seeking feedback to help us develop a new version. This week (18-24 June) is Learning Disability Week and the theme for this year is health. The aim of Learning Disability Week is to improve healthcare in hospitals and the quality of health information available to people with learning disabilities. In 2014, we launched our first EasyRead All about lymphoma booklet – a guide to lymphoma written and designed for people unable to access other health information, such as those with learning disabilities. We are currently developing a new EasyRead booklet and would like hear from anyone who used, or knows someone who used, our previous All about lymphoma booklet. We’d also like to hear from anyone who feels they would benefit from such a booklet and who would like to be involved in the development of a new EasyRead publication. We want to help ensure health information is available to everyone and we understand the importance of making sure we offer accessible information about lymphoma.We hope to hear from anyone who used our previous EasyRead booklet. We welcome feedback on how to improve on that booklet as well as hear ideas for developing our new publication.